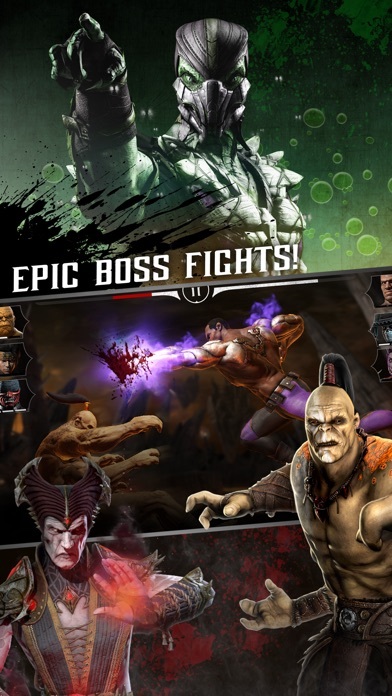 MORTAL KOMBAT MOBILE brings its trademark Fatalities to mobile, with stunning graphics, and over the top moves! Assemble an elite team of Mortal Kombat warriors now and prove yourself in the greatest fighting tournament on Earth. 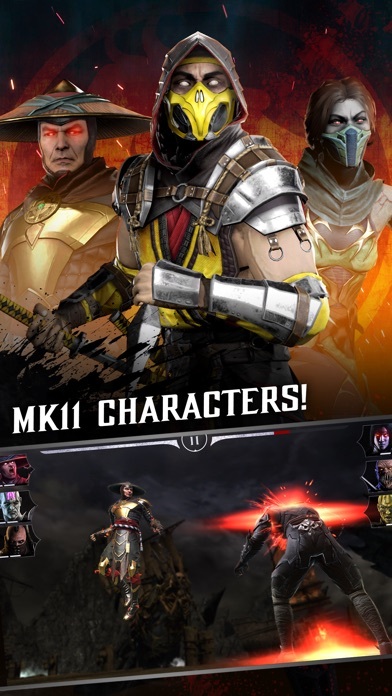 MK11 CHARACTERS Experience three Mortal Kombat 11 console characters right now in Mortal Kombat Mobile! Battle through special Trial Challenges as MK11 JADE and MK11 RAIDEN to add them to your roster! And earn Mortal Kombat 11 SCORPION through multiplayer rewards! FIGHT IN BRUTAL 3 v 3 KOMBAT Create your own team of Mortal Kombat fighters and lead them into battle to earn experience, new special attacks, and powerful artifacts. Team up warriors with unique synergies to get an advantage over your enemies such as Team Ronin, Team Nightmare, and Team Day of the Dead! 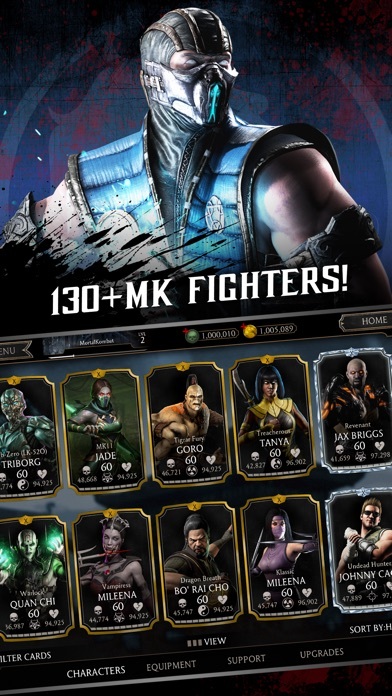 BUILD A MASSIVE ROSTER Collect over 130 Mortal Kombat characters including veterans like Scorpion, Johnny Cage, Sub-Zero, Cassie Cage, Ermac, and many others. 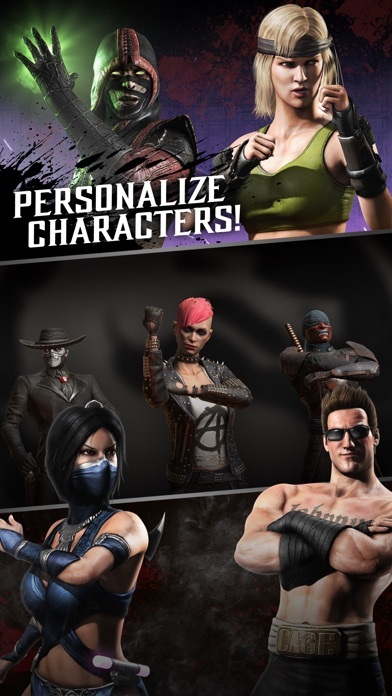 Discover the newest additions to Mortal Kombat Mobile such as the bloodthirsty Vampiress Mileena, soccer champion Kombat Cup Sonya Blade, mysterious Klassic Reptile, and warrior princess Ronin Kitana. COMPLETE DIFFICULT CHALLENGES Prove yourself and complete a series of matches to bring new Mortal Kombat warriors to your roster! A new challenge begins every week! MULTIPLAYER FACTION WARS Compete with other players in Faction Wars, an online competitive mode where players engage other player teams. Rank up in your own Faction’s leaderboard to earn weekly prizes. PERSONALIZE YOUR GAME Unlock unique character customizations in Feats of Strength. Win battles to show off your mastery with limitless combinations of action packed Victory Stances, insulting Victory Taunts, and champion worthy War Banners. Unlocking Feats of Strength also boosts stats for characters! 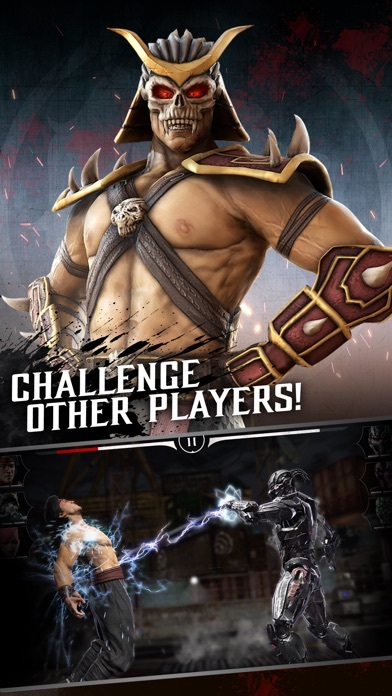 JAW DROPPING FATALITES Mortal Kombat Mobile brings its trademark Fatalities to mobile, with stunning graphics, and over the top moves that will punch you right in the guts. EARN REWARDS ON EPIC QUESTS Send characters on epic Quests to earn special rewards! 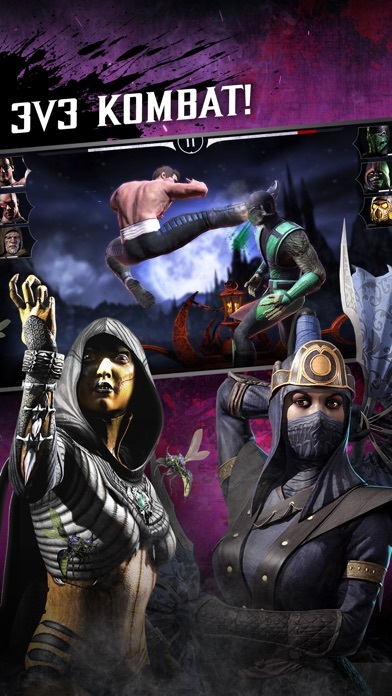 Begin your journey in Outworld and make your way to NetherRealm! NOTICES: * Mortal Kombat Mobile features high quality visuals. Performance is not optimized on devices with less than 1.0 GB RAM. * 64-bit devices are required to download from the App Store. * Mortal Kombat Mobile is an online only game. * A minimum of 1.1 GB of free space is required on your device. Content is generally suitable for ages 17 and up. Contains intense violence, blood, and gore. I’ve been playing MortalKombat for a few years under the name “Deathreaper”now. Something happened awhile back. The app wouldn’t let me load it back up, so I had to start all over. But I used a different username. Was playing for a few months and it did it again. Had to remove the app and download it again. Was wondering if it possible to get my other username put on this one. The other username is “SycoBalistic. I have a lot of awesome fighters on there and was hoping to get them back. Was hoping you could help. Thank you. A loyal fan. You guys just will not let up on that 3 characters every 12 hours will you... just bring back the old shop and just let us enjoy the game like we use to. Stop being so hard headed. 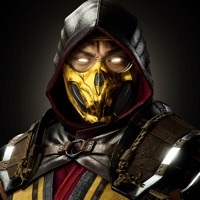 You don’t need to ruin a perfectly fine game to ensure people play MK 11.